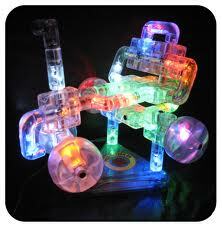 Flip Out Mama: Laser Pegs: Light Up Building Toys??!?!?! Awesome! 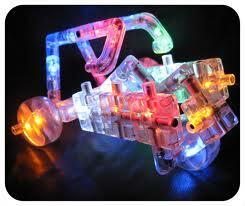 Laser Pegs: Light Up Building Toys??!?!?! Awesome! If you have been a reader of my blog for any length of time, you know my plight. My boys are video game, technology junkies, and pretty much the only time Tater and his dad spend together is if both of them has a controller in hand. I absolutely HATE this, and would try anything to get them to have some good old fashioned fun together! I think I may have found just the ticket! Let me introduce you to Laser Pegs! Laser Pegs are toy construction sets, but not like anything you have seen before! Laser Pegs takes it to the next level with their awesome light up pieces! Each piece feeds the next piece into a low voltage current. You can build with them with lights on or lights off, either way works just fine! We received the Laser Pegs 4 in 1 Power Kit! It retails on the site for $45.95, which is well worth it for the hours of fun that you will receive! The greatest part about this kit is that it contains 60 pieces, and two peg cords, along with two power bases. This allows for two people to play at once! This kit allowed for the boys to build 4 different models: Starship Cruiser, Yard Mower, Sand Rail, and Hang Glider. I was so impressed with this kit. It was a great way to get my boys out of the front of the television and to also find a way for son and daddy to connect. It was so nice to see them play together and have fun! There hasn't been a day that went by that they haven't played with the Laser Pegs, even if it's only for a few minutes. Tater loves to build, even if it's not a "vehicle" or something from the box. He just likes to build creatively, and I love being able to let him! I totally recommend that any moms with boys (or girls, what the hey!) get one of these awesome Laser Pegs kits! If you are interested in getting one of your own, check them out here!